The Baby Book was intended for “every mother, present or prospective.” It was the 1907 equivalent of the Right Start catalog. A woman could start shopping while she was pregnant, and keep the catalog around to order more as her baby grew. It covered every category of baby goods. What made this catalog so innovative was that it organized products according to the needs and shopping patterns of the consumer, rather than by categories that made sense to producers. The Sears “Big Book” of the era scattered baby goods across 700-some pages, with baby clothes next to adult clothes, diapers with tablecloths and towels, and baby spoons with silverware. To shop from the Big Book, a woman would have to know exactly what she needed, and searched for each item separately. The Baby Book educated women about all the items she might need or want, probably many more than she would have come up with on her own. 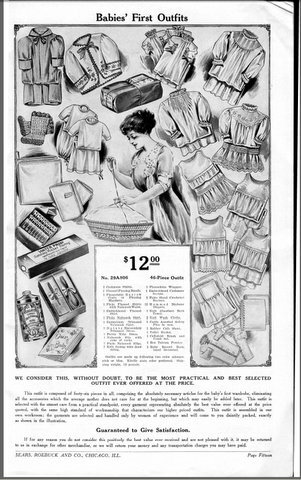 With this catalog, Sears began to think of pregnant women as a distinct category of consumer, and implicitly recognized the marketing incentive to reach women before they had their babies, while they still needed lots of stuff, and might be in the mood to buy extra. And thus we see the beginnings of shopping for the baby as one of the greatest potential pleasures of pregnancy. This entry was posted in parenting, pregnancy and tagged advertising, consumption, marketing, pregnancy on March 20, 2014 by larafreidenfelds.